Enhancements to the 994, 1194 and1396 model RoGator sprayers from Croplands Equipment take them to the next level from a technical standpoint. Replacing the now superseded 984, 1184 and 1386 units, the critical new feature is a proven drive system that AGCO has engineered to deliver even higher levels of in-paddock performance and reliability. The new RoGator sprayers’ drive system consists of a two-piece construction – a hydraulic motor and a separate gear reduction hub –that delivers more power to the ground, and more efficiently than ever before. All RoGator sprayers now come with seven speed ranges, thereby improving productivity by allowing operators to better match the speed range to field conditions. This translates to quicker acceleration and improved power management. The new drive system also enables the new RoGator sprayers to run at lower engine speeds in transport – 1,950 rpm compared to 2,100 rpm – to pare back fuel consumption. As a bonus, there’s a quieter cab environment and a useful top road speed of up to 57 km/hr. 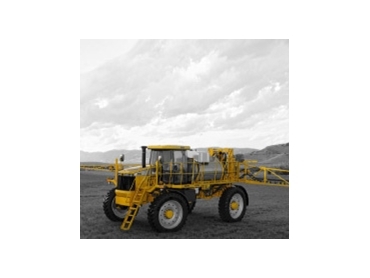 When operating in first range, the 2011 RoGator sprayers now distributes power equally between the front and rear wheels to deliver unmatched performance in tough field conditions. In second through to fourth ranges, power distribution changes to a 40/60 ratio to eliminate ‘wheel hop’ to further increase overall field performance. A C-channel frame that flexes over rough terrain while maintaining the strength to with stand the toughest conditions. A six-post application cab with a wide door entry, panoramic view and the best visibility in the industry for both comfortable and safe operation. Optional GatorTrak four-wheel steering that shrinks the already outstanding 7m turning radius to an amazing 4.1m. A choice of four boom options from 24m to 36m wide. All feature tip and full boom breakaway for added durability. A current promotion sees Croplands including free GPS equipment on all 1396 model RoGator sprayers, offering buyers a choice of either Raven or TopCon products.